Governor of the Bank of Guyana, Dr. Gobind Ganga. 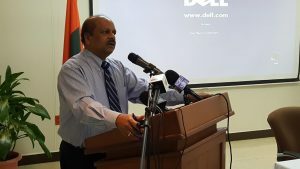 The Governor of the Bank of Guyana, Dr. Gobin Ganga, has assured that there is no shortage of foreign currency to transact international business such as wire transfers, but there are fewer United States (US) notes circulating at cambios and commercial banks partly because the increasing number of foreign workers are buying up the bills. “There is an increase in demand with more foreign workers here,” he said. Ganga was contacted against the background of the selling rate for the US dollar increasing from GYD$213.00 to GYD$217.00 in the last few weeks. The Central Bank Governor acknowledged that “there is foreign exchange currency shortage” as far as notes were concerned, causing a number of commercial banks and cambios to knock at the Bank of Guyana’s doors for US dollars. He said the shortage was not due to reduced earnings from major exports – bauxite, gold, rice and sugar – but because the Bank of America, which was responsible for transporting American dollars to Guyana, has pulled out. “We are getting all of that. There is no shortage of foreign exchange. The shortage is only the actual notes. As a matter of fact, the rates have been stable and even somewhat appreciated so there is no shortage of foreign exchange in the system. It is just that there is a shortage of notes,” Ganga said. At the same time, he said foreign workers from the Caribbean and extra-regionally have been buying notes to remit or take with them. “As you know, when people buy notes and they take the notes out, those notes are not coming back in and (it) is not like we are dealing with wire transfers. These are notes when they go you have to replenish them but we are making efforts to get more notes through another supplier,” Ganga told Demerara Waves Online News. At least one privately-owned company, Muneshwer’s Shipping, has asked its customers to pay in US dollars because the shortage has caused it to be unable to pay the Maersk shipping line, SeaLand. If customers do not have US dollars, they were told to pay in Guyana dollars at a rate of GYD$230 = U$1.00 instead of GYD$220. Dating back to November 2018, the Guyana Revenue Authority (GRA) has been using an exchange rate of GYD$208.50. The Bank of Guyana Governor said the shortage has nothing to do with fewer Cubans coming to Guyana and were instead going to Panama, Haiti and Suriname.